How to share my Google Drive? Google Drive is a cloud storage and file synchronization service developed and launched by Google. The Drive offers users an online storage space where they can store their images, videos, documents, etc. Google Drive can be easily accessed from any device like Smartphone, tablet, PC, Laptops etc. New users get 15 GB of free storage space on Signup which is shared with other Google services like Gmail, Google+ etc. it is possible to share your Google drive with others. Users can easily share the files and folders stored on their drive with other users through their email address or sending them a share link. Sharing files and folders on Google Drive is very easy. You just need to select the files that you want to share and enter the email address of the people who you want to share it with. Follow the steps if you want to learn how to share a file or folder in Google Drive. Step 1: Open Google Drive in a web browser or open the Google Drive mobile app and log in to your Google account. Select the file or folder that you want to share. Step 2: Click on the “Share” button at the top or right click on the files or folder that you want to share and click “Share” from the popup menu. Step 3: You will see a popup menu now. Enter the email address of the person who you want to share files with. Step 4: Click on “Advanced” to change privileges of the users on the file like edit, View or comment. Finally click on “Done” to save changes. That's all! The shared files will take some time to be accessible by the other person depending on the size of the files. Cloud storages like Google drive are a good way to backup your files and folders. You can upload any type of file like images, videos, documents, and others on your Google drive. Users also have the option to share their drive with other users. The files stored on Google Drive are permanently stored unless you delete them yourself. You can also download your saved files at a later date. But, downloading media files from Google Drive directly can be very troublesome and slow process. So you would need a video downloader to download cloud storages. When searching for a cloud storage downloader, you will encounter lots of software that will promise to be the best. 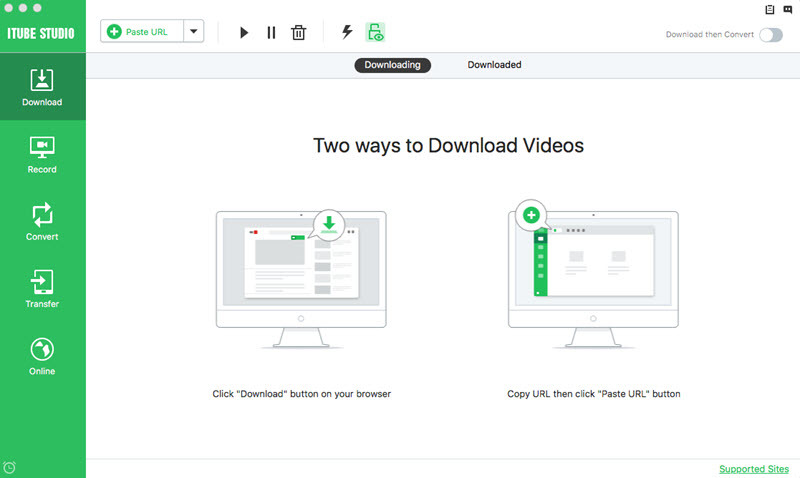 But if you are seriously searching for the best, then you should choose iTube Studio Video Downloader for Mac (or iTube Studio Video Downloader for Windows), which is full of powerful tools that allow you to download and convert online videos. The download speed is 3x faster than other downloading tools. It also has a recording feature that can record videos from websites where downloading is not possible. The iTube Studio also has a private mode that lets you download files in a protected folder. This folder can only be opened with a password. Download media files from the biggest cloud storages like Google Drive, OneDrive, DropBox, OpenLoad, etc. Download online videos from more than 10,000 websites including YouTube, Facebook, Lynda, Yahoo, Vimeo, etc. Support downloading videos in multiple resolutions like 360p, 480p, 720, 1080p, 4K, UHD etc. 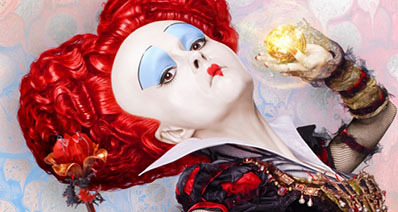 in the original quality. You can download multiple files at once in batch, just paste the URLs of the files and start the downloading. Convert the downloaded YouTube videos into MP3 format. You can even record or cut audio from online videos directly. Play the videos as it has an inbuilt media player plugin. You can play any media file easily with the built-in player. Built with a Private Mode to keep your downloading process under protection by a password known by yourself only. Launch the Google Drive media file downloader after the installation is completed. You can see various options on the left side of the iTube Studio interface like Download, convert, Transfer, Record etc. Click on “Download” to open the download tab. Now get the shareable link to the Google Drive file that you want to download by visiting the https://www.drive.google.com/ in a web browser. Login to your account and select the files that you want to download. Right-click on the file and click on “Get Shareable link” option. Alternatively, you can click on the shortcut icon given at the top with the share button. Copy the URLs of the media file and switch to iTube Studio, then click the "Paste URL" option. 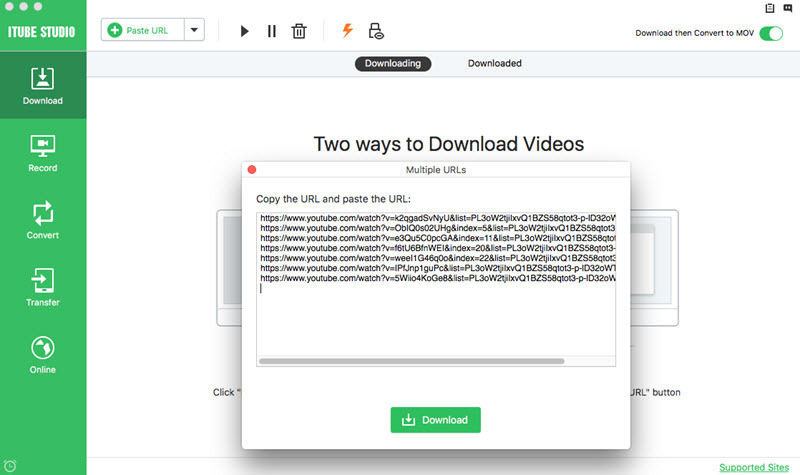 Once got the URL pasted in the blank, iTube Studio will automatically analyze the URL and start to download within seconds. You can find in the Downloaded tab or the default folder in your Mac or Windows PC.